The margarita is the most common of all tequila-based cocktails. There are three main ingredients in a margarita: Tequila, Triple Sec, and lime juice. The traditional recipe is 3:2:1 – three parts Tequila, two parts Triple Sec and one part lime juice; however, the IBA standard is 7:4:3 = (50% tequila, 29% Triple Sec, 21% fresh lime or lemon juice), which keeps 50% tequila, but uses slightly less Triple Sec and correspondingly slightly more lime juice. Other orange flavored liqueurs are frequently substituted for Triple Sec; Cointreau is most common, but there are many alternatives. The rim of the glass is often, but not always, salted. Traditional tequilas are dry, and served without ice; however, one may prepare sweet tequilas, often with other fruit juices such as pineapple, or serve over ice, or even blended. These sweet and iced variants are looked down upon by traditionalists, and despised as “party drinks”, but frequently served at parties. Blanco (unaged) is most common and recommended, but reposado (aged under 1 year) is also often used, and añejo (aged 1 to 3 years) is sometimes used. The issue is that tequila is the focus of the drink, and conversely the margarita is the most common tequila cocktail. Blanco is most assertive, and the purest expression of agave, while reposado is gentler and with somewhat less agave and a little wood (from oak); añejo has less agave taste and makes a very gentle margarita. 100% agave is recommended, as it is the focus; mixto (less than 100% agave) is significantly cheaper, but of inferior quality. If cost is an issue or if very sugary, mixto may prove acceptable, though one should compare with 100% agave before serving. Widely varying grades of tequila are used in margaritas, from the cheapest grade to the fanciest. This significantly affects the quality and the cost, and comparison is strongly recommended. Triple sec is most common, and cheap; brands vary in quality and price. Cointreau is a common substitute, and significantly more expensive, but considered by many to be far superior to triple sec. Grand Marnier is another well-respected orange liqueur, of similar quality and price to Cointreau, while Patrón Citrónge is a more recent addition, somewhat cheaper than both, and Gran Gala is an Italian version that is again somewhat cheaper. There are many alternatives for orange liqueur, some little-known and little-advertised; curaçaos may also be used. Issues to consider in orange liqueur include: alcohol content – orange liqueurs vary in alcohol content from 15% to 40% (30 to 80 proof); neutral spirits base (such as Cointreau) or brandy base (such as Grand Marnier) – this affects taste and color; and price – generic triple sec adds negligibly to the price of a margarita (compared to tequila), while name brands can double the price. Most often fresh lime juice, ideally from key limes; Persian limes are most common in stores, however. One can also use other citrus such as lemon, or even others such as grapefruit, though this is properly a variant. One may even use other fruit juices (as is common in daquiris), though this should be flagged. Fresh lime juice is strongly recommended, and considered a defining characteristic; one may use Rose’s lime juice or sour mix, but this yields a significantly sweeter drink due to added sugar, and is considered deeply inferior. Generally coarse salt is used; one may also use fine salt, or various flavored salts or sugar (of various fineness) instead. Some serve sweet tequilas; this is most easily accomplished by using simple syrup, sour mix or pre-packaged “tequila mixes”. Sweet margaritas are looked down upon as “party drinks”, and subtle details of the tequila or orange liqueur tend to be masked by the overwhelming sugar flavor, but they are widely served at parties. 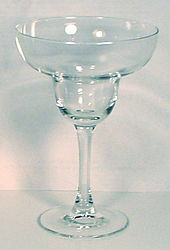 The margarita glass may be used, particularly when serving a blended fruit margarita. Most formally a cocktail glass is used, as the classic margarita is a classic drink. Alternatively one may use an old-fashioned glass, particularly if serving on the rocks, or serve in a specialized margarita glass, particularly when serving with a blended fruit margarita. Ratios vary; they almost universally adhere to the order of tequila, triple sec, lime: the focus is tequila, and extra lime would yield a very sour drink. 2:1:1 = 6:3:3 (50% tequila, 25% Triple Sec, 25% lime). 3:2:1 = 6:4:2 (50% tequila, 33% Triple Sec, 17% lime). 3:1:1 = 6:2:2 (60% tequila, 20% Triple Sec, 20% lime). 1:1:1 = 6:6:6 (33% tequila, 33% Triple Sec, 33% lime) – a very sour variant. in the amounts of 35 ml (seven parts) tequila; 20 ml (four parts) Cointreau or Triple Sec; and 15 ml (three parts) lemon or lime juice. For overall amounts, one often uses 1.5 oz. or 2 oz. of tequila; the juice of half a lime is then enough. A cocktail glass, in which a margarita is generally served, can hold 2 such margaritas (assuming no ice), as reflected in the IBA standard quantities, and margaritas are mostly alcohol, so a full cocktail glass of margarita is a significant amount of alcohol. 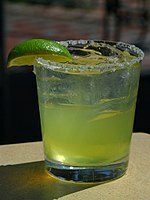 (Optional) Salt the rim – rub the rim of a cocktail glass with a lime wedge (or half) or paper towel, dip in coarse salt. One often takes care to coat only the outside of the rim by only rubbing the outside with the lime or towel, and rotating the outside of the rim through a salt dish (rather than dipping the entire rim into a dish of salt), and then shaking (after a brief pause for drying), so that the salt does not fall into the drink. One may also salt half the rim, or salt most of the rim but leave a gap, allowing the drinker the option of a salted or unsalted rim. More simply, one may ask the drinker their preference. Salt may be omitted as interfering with the flavor of the tequila, or used to mask the flavor of an inferior tequila. Alternatively, for sweet tequilas one may use sugar instead on the rim. One may pre-salt glasses, as this is time-consuming and there is little loss from doing so ahead of time. Mix tequila, orange liqueur, and citrus juice. One may alternatively stir, but shaking is preferred for mixing with fruit juices, and the tequila is a strong drink, so the ice shards of shaking are of little consequence or even a benefit. Some serve tequila on the rocks, though more purely it is served strained. (Optional) Garnish with a lime wedge or slice. Serve in a sugar or salt rimmed glass, on the rocks or with crushed ice. In a blender, combine the ingredients and blend until slushy. Pour into prepared margarita glass and serve with a lime wedge. Strawberry or peach, with lemon juice. Note, however, that fruit Margaritas are not recognised as part of the standard Margarita repertoire. Strain into a chilled margarita glass with a sugar or salt rim. Garnish with a sugar coated lime wheel. This page was last edited on 23 May 2012, at 22:41.